The enigmatic, otherworldly photographs of Ralph Eugene Meatyard belong to a very real place. Ralph Eugene Meatyard, Untitled, circa 1970, gelatin silver print. The photographs of Ralph Eugene Meatyard seem to depict a dream world. Sometimes scary, sometimes endearing, but always uncanny, his small-scale black-and-white prints invite the viewer into a zone where faces are replaced by masks, dolls come to life, and children play amid ruins. 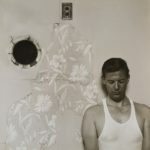 So it might come as a surprise to learn that Meatyard’s work was firmly grounded in a real place, his home town—to be specific, in Lexington, Ky., where Meatyard lived with his wife, Madelyn, and their three children, all of whom are featured in his photographs. There he pursued a career as an optician and business owner while photographing on weekends and holidays. 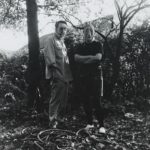 He also spent a good deal of time with a very creative group of friends who helped him become an artist and sustained and stimulated him in his work over a period of two decades. Some of these people are now famous, more so than Meatyard—the Trappist monk Thomas Merton; the poet, essayist, and environmentalist Wendell Berry; the writer and artist Guy Davenport; and perhaps most important, the photographer and curator Van Deren Coke, who taught Meatyard and enabled him to start his artistic career. A book just published by the University of Kentucky Press aims to situate Meatyard in this place, not so much in terms of influences as in terms of the way he used the locality in his work, how he took it as both setting and subject and then took off from there. Ralph Eugene Meatyard: Stages of Being is edited by Stuart Horodner, director of the University of Kentucky Art Museum in Lexington and Janie M. Welker, curator of collections there, and features essays by them as well as short reflections by a variety of prominent photographers, including Duane Michals, Emmet Gowin, Roger Ballen, Laurel Nakadate, and Catherine Opie. It is issued in conjunction with an exhibition of the same name that ran at the University of Kentucky Art Museum last fall and that will be on view again this fall and winter, at the Bates College Museum of Art in Maine. Meatyard’s son Christopher, now a photographer himself, is quoted by Horodner as saying, “He picked the environment first. 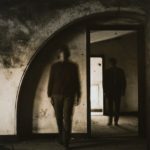 Then he’d look at the particular light, in that moment, in that place, and start composing scenes using the camera.” In addition to posing his wife, kids, and friends, Meatyard would often salt the scene with objects he’d found on his ramblings or bought at antique or curio shops in the area. Sometimes the staging was elaborate; sometimes it was subtle. Meatyard had the genius of knowing how just one detail could push an image over the border from the everyday world into a parallel, strange one. 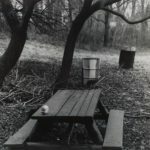 For example, in an untitled work from 1968, we see a picnic table with two garbage cans in the background. The way Meatyard has rendered the lighting makes the suburban park look like the forest primeval; the branches, so dark as to be almost in silhouette, are reaching out like the arms of mythic tree people. So far everything is as found by the lens, but then we notice the dirty, decapitated head of a doll resting on the table (doubtless put there by the photographer), its expressionless eyes staring off toward the lower left corner of the frame. In another untitled image, from around 1970 (Meatyard rarely titled his photos, which he made with a Rolleiflex camera and printed fairly small, usually around seven inches square), no props are used, and none are necessary to convey the desired eerie quality. 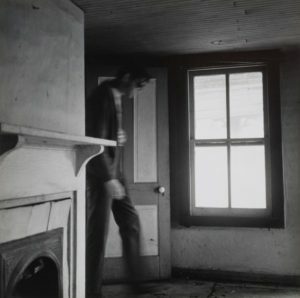 A man enters a bare room in a house whose architectural details suggest that it is an old, American-vernacular type. The light from the window is printed as bright white, eliminating any data from outside. The tone of weirdness is greatly enhanced by the fact that the human figure, slightly blurred and bordering on featureless, looks too tall for the space, as if he were entering a child-sized house. The weirdness and local architecture, often crumbling or rotting, have led some observers to call Meatyard’s work “Southern Gothic,” but that’s not quite right. For one thing, Meatyard wasn’t Southern; he arrived in Lexington at in 1950, at the age of 25, and stayed till his death from cancer in 1972, but he was born in Illinois, in a town called—you can’t make this up—Normal. After service in World War II and studies at Williams College (pre-dental, another incongruous fact) and Illinois Wesleyan (philosophy), he learned the optician’s trade and was invited to Lexington by the optical firm of Tinder-Krauss-Tinder. As it happened, the company also sold photographic equipment and supplies, and that got Meatyard interested. He bought his first camera that year, 1950, and soon was exhibiting in the group shows of the Lexington Camera Club. Masks feature prominently in Meatyard’s work—worn by the people who pose for him, and sometimes just lying around, even hanging from a tree. In Latin, the word for mask is persona, and paradoxically, what Meatyard was doing by putting his figures in masks was to depersonalize them, to mask their individuality. He did this to get at something deeper than the merely personal, something that unites everyone; In his famous fantasy-narrative series “The Family Album of Lucybelle Crater,” in which his own family plays the parts wearing grotesque latex masks, all of the characters, male or female, old or young, are named Lucybelle Crater. What Meatyard was driving at was the sense in which we are all the same person.